Habitat: Heaths and moors, damp or dry meadows, near forest paths and along roadsides and clearings. The plant is native to England and Scotland. 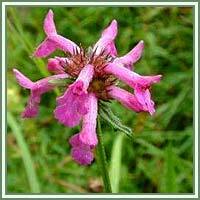 Description: Perennial shrub, grows up to 300 centimeters. Stem is hairy, unbranched or partly branched. Leaves are opposite, the lower ones are oblong and heart-shaped, and the upper ones are more narrow and pointed. Flowers are purple red in color, appearing above the rosette of leaves during summer (from June to August). Useful components: Betulinic acid, D-camphor, delphinidin, hyperoside, manganese, oleanolic acid, rosmarinic acid, rutin, ursolic acid, as well as various saponins and tannins. Medicinal use: The plant is considered to be anthelmintic, astringent, carminative, cardiac, diuretic, stomachic, expectorant and vulnerary. It is usually recommended for asthma, bronchitis and heartburn. Infusion is used in treatment of anemia, heart troubles, neurasthenia and neuritis, stomach aches, ulcers, bloody diarrhea, bladder and kidney problems. 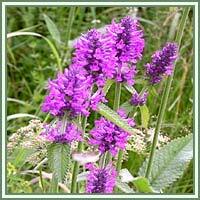 Poultice of the crushed root is applied to varicose veins, swellings and sore muscles. Infusion of the fresh leaves is used in treatment of sore throat, bronchitis and tonsillitis. The juice obtained from the whole plant is used to heal cuts and external ulcers.